Over the last decade, tourism has become one of the world’s largest industries. We all know that it’s having a huge impact on our environment. But what about the cultural impact of tourism and our ongoing hunt for ‘authentic cultural experiences’? Imagine yourself eating an authentic meal at a local’s home somewhere in, say, Cambodja, Indonesia or Tajikistan. Your host wears his best clothes and serves you his best food. And of course you take pictures. But what is that photo proof of? An authentic moment? A performance? Or mutual exploitation? What is the influence of our presence and our insta-approved photos on a family’s home, a town or a nature reserve and the locals who live there? All films in this Top 6 by director Mirka Duijn (The Industry) depict funny, awkward and often quite chilling encounters between tourist and host. Framing the Other is a short documentary about the Mursi, an Ethiopian tribe. Mursi women are known for placing large plates in their lips, which has become the subject of tourist attraction in recent years. Each year, hundreds of Western tourists come to take photo’s of the natives. 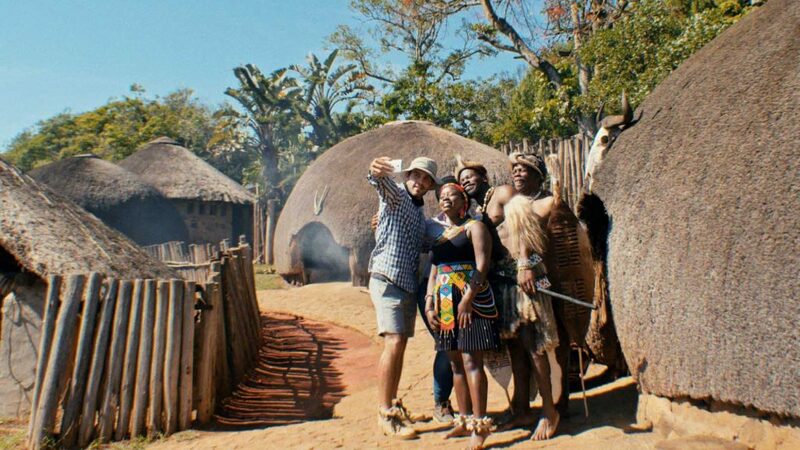 Even to such extent that posing for visitors has become the main source of income for the tribe. However: the natives don’t dress as they used to. In order to please the tourists they exaggerate costumes or even make up new authentic looking designs. In Framing the Other, the makers follow two ladies: a woman from the Mursi tribe, who prepares to meet the tourists of the day, and a Dutch tourist on a ‘safari’ to see the tribe. Their encounter is short and painfully awkward. The makers manage to capture the destructive impact tourism can have on traditional communities in a very simple and straightforward way. See also: an excerpt of the film on Vimeo. In the short fiction film The Beast by Samantha Nell and Michael Wahrmann take the idea of The Performing Tribe one step further. Set in a small authentic-looking Zulu village specially built for tourists, the film depicts a group of local actors who perform the same Zulu rituals on a daily base. Being completely bored by the simple performances they daydream about performing plays by Shakespeare. The film ends with a group of tourists being shocked by not getting the performance they expect… This funny and, again, slightly awkward film thus playfully addresses how culture is staged and performed according to the stereotypical lines expected by (Western) tourists. Teresa is a single, middle-aged housewife who goes to Kenya on a beach vacation. On her first swim in the crystal clear sea she is immediately surrounded by ‘beach boys’ who try to sell her souvenirs, excursions, but above all themselves. Theresa falls for the charms of one of them, after which an odd relationship develops. Did she really fall in love? Or is it simply mutual exploitation? The power of Paradies: Liebe is that Seidl does not designate perpetrators or victims. Teresa uses the ‘beach boy’ who in turn uses Teresa. The outcome is an awkward but at the same time heartwarming depiction of the way that the economics of tourism influence human lives. This documentary does not address the tourist-gaze, but I decided to add it anyway, because it is so very genius in every other sense. Frequently grotesque, banal and at times even quite ugly, Tender’s Heat: Wild, Wild Beach depicts Russians at play on the beaches of the Black Sea. In a sequence of images of bared bodies, muddy beaches and numerous splashes of spilled beer we meet a mobster, a lonely woman, a group of horny teenagers and even Putin, who overviews all from high upon his horse. This bizarre, but at the same time poetic film drove half of the audience out of the cinema when it was shown at IDFA (Special Mention Award) in 2007. I had a hard time watching it, too, but over the years this film stayed with me as one of my all time favourites. It is a study of humans spending leisure time that once watched leaves an almost physical impact that will never vanish. Snowy Lapland is a favorite tourist haven for tourists from all over the world, especially for the Chinese. In this documentary a group of Chinese sculptors arrive to build an exotic experience park in the middle of Finnish Lapland. Among them Huang Sheng, a young Chinese student. Every day he dresses up as panda to attract tourists, and as he wanders around in his panda outfit, Huang reflects on the differences between the Finnish and Chinese societies. Wonder World of Ice thus tells the story of the changes modern Lapland is going through as it becomes an international entertainment hotspot. Over the course of four years, director Daan Veldhuizen followed two friends who live in a small tourist village in remote northern Laos. The village is changing rapidly due to tourism. And, whilst the visiting backpackers search for a traditional experience, the inhabitants of the village discover the attractions of the West. Two worlds meet at the crossroads of their desire; one longing for authenticity, the other for modernity. In this micro-cosmos, their encounter leaves no one unchanged. You can watch the complete film with Dutch subtitles on YouTube.